We find that the Petr. 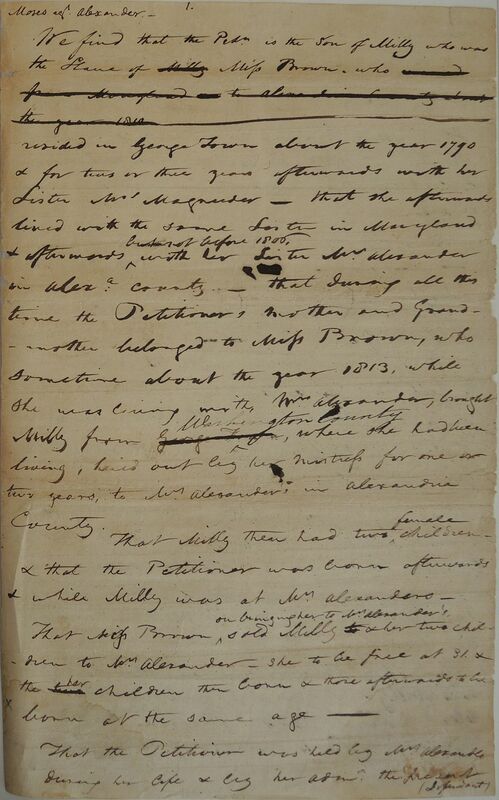 is the son of Milly who was the slave of Milly Miss Brown, who [strikethrough] resided in George Town about the year 1790 & for two or three years afterwards with her Sister Mrs Magruder. That she afterwards lived with the same sister in Maryland & afterwards but not before 1806, with her sister Mrs Alexander in Alexa. County. That during all this time the Petitioners mother and Grandmother belonged to Miss Brown, who sometime about the year 1813, while she was living with Mrs Alexander, brought Milly from George Town Washington County, where she had been living, hired out by her Mistress for one or two years to Mrs Alexander in Alexandria County. That Milly then had two female children & that the Petitioner was born afterwards & while Milly was at Mrs. Alexanders. That Miss Brown on bringing her to Mrs. Alexander's sold Milly to & her two children to Mrs. Alexander, she to be free at 31 & the two her children then born & those afterwards to be born at the same age. 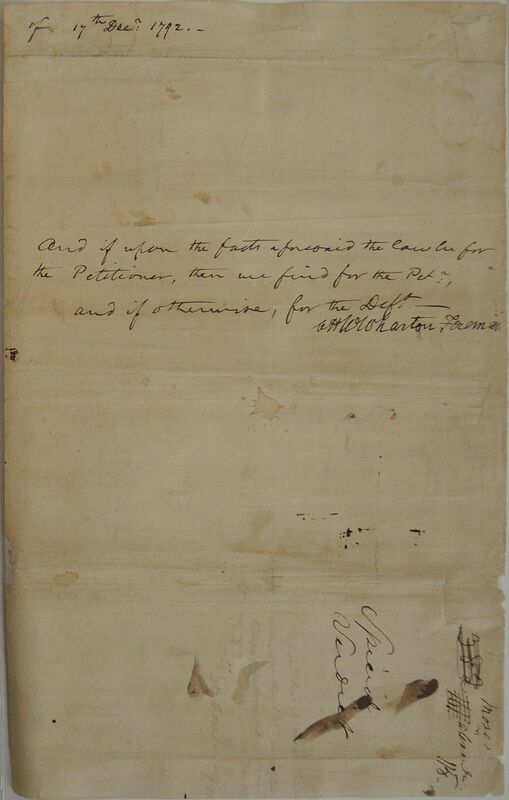 That the Petitioner was held by Mrs. Alexander during her life & by her admr the present (Defendant) 2 Defendant since, not as a Slave for life, but as entitled to freedom at 31 yrs of age. 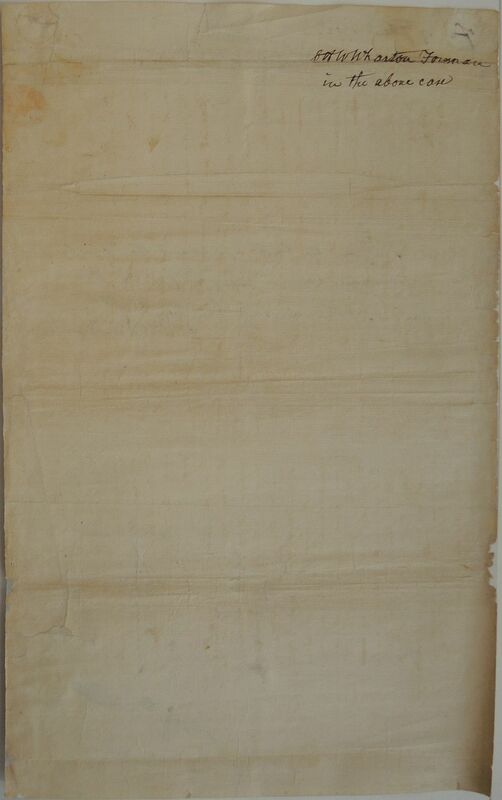 That Miss Brown died in 1825 making her last will & testament (here insert it. That Miss Brown by her will recognized the terms of sale of said negroes to her sister to be that they were to be free at 31 years of age. 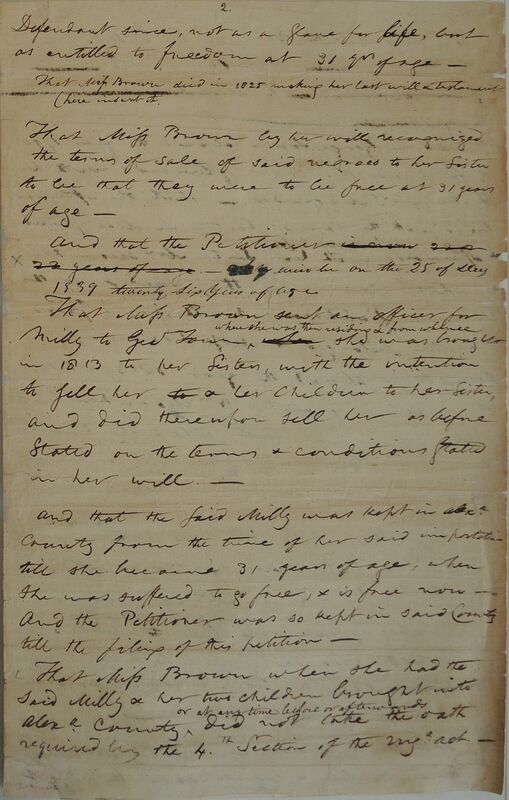 That Miss Brown sent an officer for Milly to Geo Town where she was then residing & from whence when she was brought in 1813 to her sister, with the intention to sell her to & her children to her sister, and did thereupon sell her as before stated on the terms & conditions stated in her will. and that the said Milly was kept in Alexa. County from the time of her said importation till she became 31 years of age, when she was suffered to go free, & is free now. And the Petitioner was so kept in said County till the filing of this petition. That Miss Brown when she had the said Milly & her two children brought into Alexa. County or at any time before or afterwards did not take the oath required by the 4th Section of the Virga. act of 17th Decr. 1792. And if upon the facts aforesaid the law be for the Petitioner, then we find for the Petr:, and if otherwise, for the Deft.